In February 2016, my friend in America invited me to join him and 2 of his friends on a trek in Patagonia. Unfortunately, during the year, his friends had to pull out, leaving just myself and Tom to continue. In February this year, my wife and I flew to Atlanta to stay with Tom and Bonnie, then the following week, Tom and I flew down to Punta Arenas, Southern Chile via Santiago. From Punta Arenas we travelled north to Puerto Natales, and the following day, transferred to Torres del Paine. The first thing that struck me was the remoteness - mile after mile of barren steppes, very little signs of life - either animal or human. The park is incredible! Snow covered mountains on all sides linked by rolling hills, steep valleys, rivers and lakes. We completed the 5 day 'W' trek, the shorter of the 2 routes - the longer being a 10 day circuit. Our first day dawned in glorious sunshine and we embarked on our 6 mile hike up the Ascencio Valley. Unfortunately, when we got to our destination - to see the 'Towers' and glacier, all was shrouded in cloud and we only saw the base - so we hiked back to the campsite to bed down for the night in our 2-man tent. Ironically, the morning after, we could plainly see the Towers from the site - shining in the morning early sun - ah well! We then packed up and moved on to our next destination, Refugio Los Cuernos. The clear blue skies clouded over and it rained - boy, did it rain! The trail soon became a stream channelling the run-off from the mountains. Thankfully, later on, it eased off and we were drying out as we arrived at the refugio. We were booked in to one of the lodges so had a shower and comfortable, warm dry bed - sheer luxury! Dry and refreshed, we commenced our 3rd day in drizzle, followed by rain - the rain stayed with us for the next 3 days - a great test for our wet-weather gear. Unfortunately, my (non-Rohan) outer shell wasn't equal to the task and had wet arms and shoulders at the end of the each day. Thankfully, the Refugio's had wood-burning stoves on arrival for the trekkers to dry out - ah, the aroma of 60 pairs of steaming socks! With our soggy trek behind us, the following day saw us kayaking along the Serrano river - in perfect weather. Arriving late afternoon to the site, we camped overnight and were up early the following morning to kayak in the Lago Serrano. 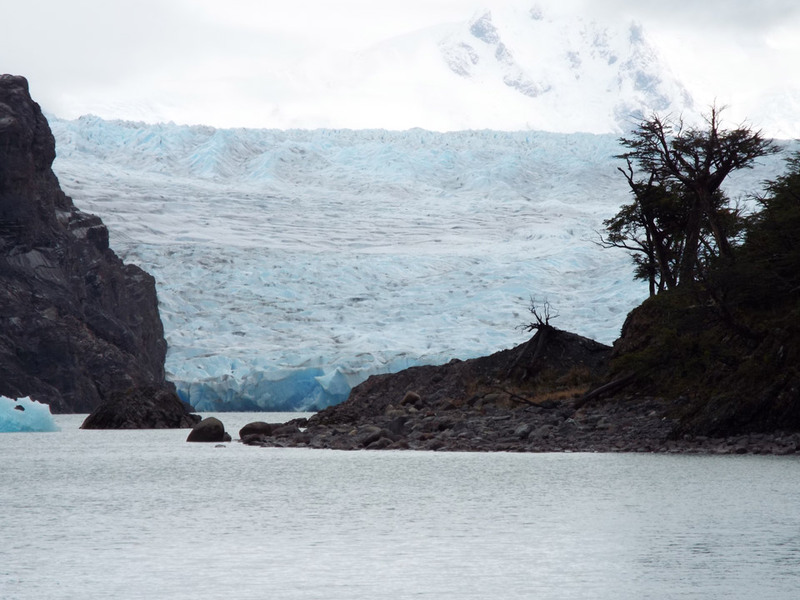 Paddling amongst the floating ice and up close to the Serrano glacier was a surreal experience - thankfully caught on my waterproof video camera. The day after, we then took a coach across the Argentinian border to the Los Glaciers region staying in a hostel in El Chalten. 2 more days of hiking - 1 in glorious sunshine, 1 in glorious rain - that's Patagonia! And so, we had finished the hard bit, the following days were mainly travelling, back in to Chile and south to Punta Arenas to fly back to Atlanta. A wonderful, life-enhancing experience and, with my videos and 300+ photo's, I will have many years' of memories. Best item of clothing? : 2 actually - my Trailblazers Convertible hiking trousers - essential for the fast changing Patagonian weather + my Worldview Shirt - even after 24 hours of travelling, it was still fresh! What do I wish I had brought but didn't? : a Rohan Guardian Jacket to keep me dry! One not-so-good thing? : my "waterproof" non-Rohan jacket that wasn't. Highlight? : Definitely the kayaking; perfect weather and a great experience!